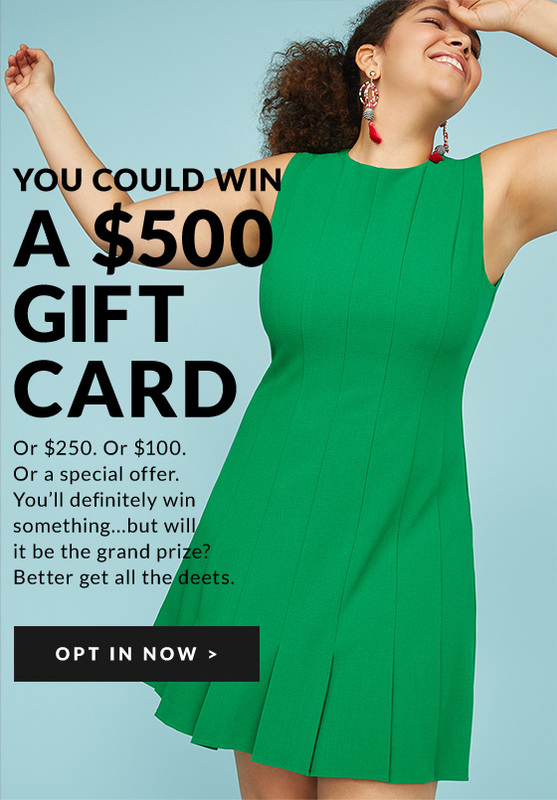 $500 gift card? Yes, please. 2018 Lane Bryant. All rights reserved. NO PURCHASE NECESSARY TO PARTICIPATE OR WIN. A PURCHASE WILL NOT INCREASE YOUR CHANCES OF WINNING. The opt-in period for this promotion begins on April 30, 2018 at 5:00 a.m. ET and ends upon live release in the Quikly campaign, which will be no later than May 12, 2018 at 1:00 p.m. ET. Open to legal residents of the 50 US or DC, 18 and over. Void where prohibited by law. Odds of winning depends on the speed of response to the Quikly go-live notification. Limit 1 prize per person. Subject to Official Rules available at: quikly.com/4330. Sponsor: Lane Bryant, Inc. 3344 Morse Crossing Columbus, OH 43219.
International Orders: Pricing and promotions may vary by region. is subscribed to receive promotional emails from Lane Bryant. You provided your email address when you registered or purchased from us. Dollar amounts for all offers are in U.S. dollars. 💌 You’ve Got SALE: 40% off clothing, swim & more. Crop it how you like it. ⚠️ Wait, did you shop these deals?